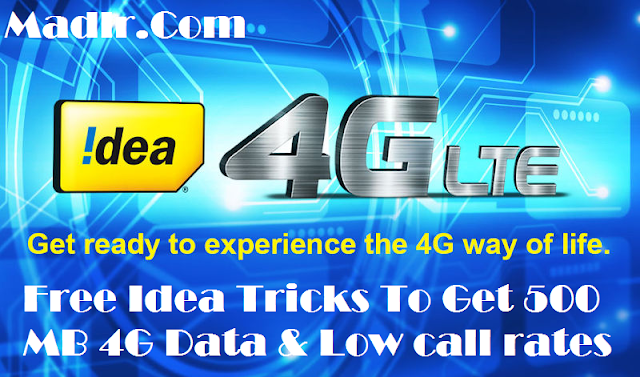 Free Idea Tricks To Get 500 MB 4G Data and Low call rates. 1) First of all, if you are idea 4G user you get 1 GB 4G data in Only 1 Rs you need to read this [All Users] Idea 4G Internet Data- Get 1 GB 4G at Rs. 1 only to giving a missed call. Or if you need 500MB free 3G data to read below. 3) Open your SMS and create a new message. 4) Then Type PORT Your Mobile Number and send the message to 1900. 5) Now it's done, You will get message of the Porting number from Idea soon. 6) After that wait for Few hours, Then Idea customer care executive call you soon within 24 hours. 7) Idea customer executive ask you Sir what is the reason for leaving idea ? 8) Give Them Answer:- I want to Join Reliance Jio Sim because they are giving Free Welcome offer of free 4G Data & Calls till March 2017 and your internet Data & plans price is very high and not Good. You need to read this: - Reliance Jio To Extend Welcome Offer To March 2017. 9) After that wait for some times. 10) They will Give you Free 500MB 3G Data & Less Call rates for free. This offer valid for every idea users.